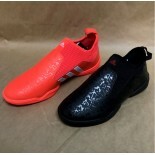 Adidas Contestant Shoe Made in Korea Adidas’ new Martial Arts Shoe, the Contestant, was developed in collaboration with the footwear development team from the company's headquarters in Herzogenaurach, Germany. -Perfect fit via elasticated sock style ankle support -Wider cut in the front portion of the shoe -Insole with mid-foot support -Front and back pivot points -Mesh sole promotes air flow where it’s needed most -Se..
White with Black Stripes The SM-II is a classic Martial Arts shoe, which is extra light and made using soft leather. On the market for over 18 years, yet still beloved for its cute and simple design. Good for training or for refereeing. 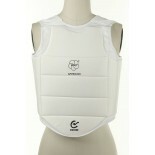 It is also well suited for all kinds of indoor sports. Sizes: 2.5, 4 – 13 (half size) Material: Polyurethane ..
Black with White Stripes The SM-II is a classic Martial Arts shoe, which is extra light and made using soft leather. On the market for over 18 years, yet still beloved for its cute and simple design. Good for training or for refereeing. 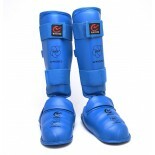 It is also well suited for all kinds of indoor sports. 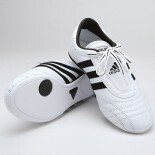 Sizes: 2.5, 4 – 13 (half size) Material: Polyurethane ..
White with Stripes The right solution for beginners. A comfortable and very light shoe with grip rubber outsole. Short lace for better stability on foot. Size: CH12, CH13, 1, 1.5, 2.5, 3, 4 - 13(half size) Material: Polyurethane ..
White with Grey Stripes The adiLux has been updated, designed to be an eye-catching, multi-purpose indoor sports shoe. The sole includes the proven adidas® torsion system for better arch support and stability. Torsion: helps the front and rear portions of the foot to move independently, allowing better surface adaptation. Sizes: 4 – 13 (half size) Material: Polyurethane ..
Black with Grey Stripes The adiLux has been updated, designed to be an eye-catching, multi-purpose indoor sports shoe. The sole includes the proven adidas® torsion system for better arch support and stability. Torsion: helps the front and rear portions of the foot to move independently, allowing better surface adaptation. Sizes: 4 – 13 (half size) Material: Polyurethane ..